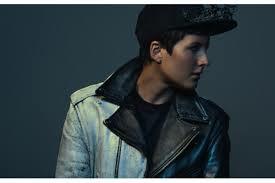 Ria Mae is someone I came across thanks to Tegan and Sara. I instantly fell in love with her style, when I saw her perform she was in a black t-shirt, black converse,black jeans and camo jacket. I love this style of outfit as it is so basic but so stylish. As you can see in the above picture she also mixes it up with a snap back and leather jacket. Which again is super easy and perfect for most occasions. I also love the above look she has from one of her photo shoots. I love a good snap back and honestly think this could be one of my go to looks this summer. A sleeveless hoody would be perfect with jeans or shorts depending on the weather or where I am. One thing about Ria I love is her style doesn't conform, meaning she can pull of the androgynous style and still keep it looking fashionable. Who are some of the people who's fashion sense you look at for inspiration? Let me know in the comments below.